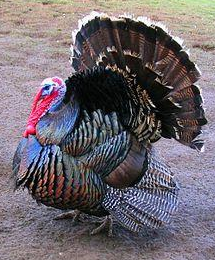 The male turkey is called a tom! Turkeys’ heads change colors when they become excited! 675 million pounds of turkey are eaten each Thanksgiving in the United States! Wow. Turkey eggs are tan with brown specks and are larger than chicken eggs! Turkeys can see in color! Turkeys can drown if they look up while it’s raining! Turkey breeding has caused turkey breasts to grow so large that the turkeys fall over! The fleshy growth under a turkey’s throat is called a wattle. Now you are armed with a bunch of facts to share with friends and family over the dinner table this week. Enjoy!